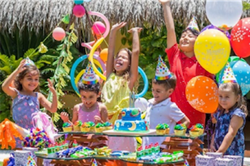 The AAA Five Diamond Grand Velas Riviera Maya helps the littlest guests celebrate their birthday with a new kid-fluenced Mexican fiesta. Taking place in either the Kids’ Club in the oceanfront ambiance of the resort or sur-rounded by the Mayan jungle, the area will be decorated with balloons, traditional Mexican candies, a piñata and personalized birthday cake. Party activities will range from XBOX and Wii, arts and crafts to mini golf and dream-catcher weaving. Included in the resort’s nightly rate, the party must be booked with a guest’s personal concierge at least two days in advance. A charge will apply for requested extras. The party will take place during normal Kids Club operations. For an over the top celebration, the resort also offers a “Billionaire’s Birthday Package” pulling out all the stops for a teen’s supersized coming-of-age celebration. Coming with a $2 million USD price tag, the party includes private jet roundtrip transportation from anywhere in the U.S., Mexico or Canada, private check-in that includes edible gold popsicles and welcome bags featuring an iWatch and a three-night stay in one of the luxury resort’s two-bedroom Presidential Suites. Also included in the package is exclsive access to the resorts’ award-winning Spa for a “Gold Treatment,” a custom designer dress by Pineda Covalin – often called the “Hermes of Mexico,” a skydive or flyboard experience for the party’s host and friends, a firework show, a candy bar, renowned DJ entertainment, and a special concert by a top performing artist from Maroon 5 to Pitbull. The resort’s “Rent Your Rock” program also allows the king or queen of the night to rent diamonds and other high-end jewelry for the special occasion, including a yellow canary diamond, radiant cut, with a center stone of nearly four carats and surrounded by 1.25 carats, all in white gold. Everything from the décor to the party’s food is set to the tee with personalized catering by Celebrity Chef Mikel Alonso of Grand Velas’ signature Cocina de Autor restaurant. Magnificent cuisine and expe-riences are abundant for the birthday bash as the package also includes a custom welcome dinner accompanied by master mixologist Moisés Sierra Sáenz mixing up high-quality “mocktails” for the teens. Nightly resort rates start at $434 USD. Rates are per person based on double occupancy and include à la carte gourmet meals at a variety of specialty restaurants, luxury suite accommodations, premium branded beverages, 24-hour in-suite service, fitness center, taxes, gratuity and more. For reservations or additional information, call 1-888-407-4869, or visit https://rivieramaya.grandvelas.com.